You'd think that having more than one dual-tuner TiVo would allow to me get everything I'd want to watch....well, actually it does/should now....now that I have 3 of them. But, it doesn't make getting everything any easier. The TiVo's don't know about each other, so they can't work together to resolve conflicts....though I wish it did (and so do a lot of other TiVo owners). 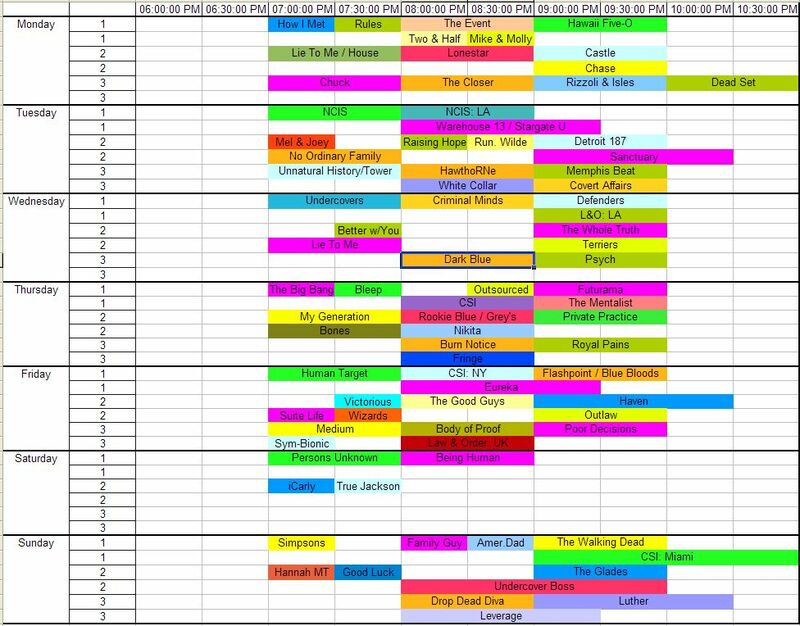 I thought about posting the grid, just so other's could see the insanity....and now with the fall premier dates happening....I figure I should post it now, before it get's anymore out of date. As you can see, there are not only slots this year where the 3rd TiVo was needed...but there's even a slot where all 6 tuners will be busy. There are 18 years 8 months 28 days 20 hours 1 minute and 27 seconds until the end of time. And, it has been 6 years 3 months 29 days 18 hours 1 minute and 29 seconds since The Doctor saved us all from the end of the World!